We end September with Article 14 from Andy Jefcoate as he continues to build his Flintloque collection. This time five new characters appear in the Witchlands and are given roles in play. The Orcs 'Stab' and 'Grab' as well as 'The Quartermaster' and 'Johann the Dwarf'. 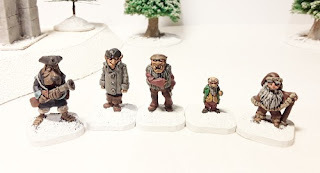 Inspired by the excellent Civilians of Valon pack which has a 28mm Dogman, two Orcs, a Dwarf and a Gnome in it. A great read for players of the game and those keen on high fantasy with a twist. Have a great weekend and we will see you all next month with more awesome!